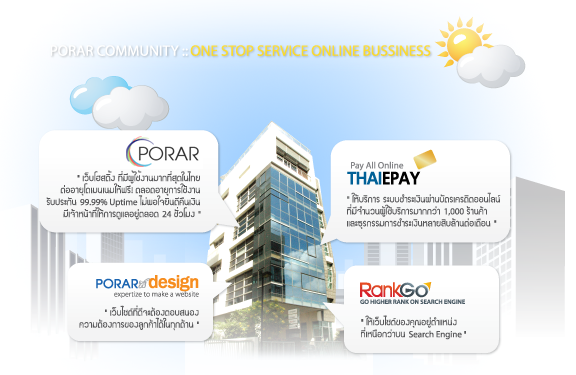 Welcome to "PORAR Community", the online community that can provide all what you need as One Stop Service. Our Porar Web Application Co.,Ltd was founded in 2001, beginning as an application developer and software seller. In the meantime, the company introduced "PORAR" which provides web hosting service, making the company one of the first providers in Thailand. That is to say the web hosting service is our earliest business which we have specialized and experienced in this field for a long time. Time goes by, E-commerce in Thailand has been expanded graudually. 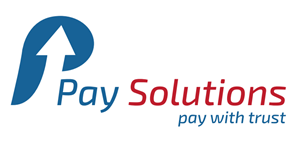 "THAIEPAY"then had been developed as an instant online payment gateway to support the growth of E-commerce service. The company was the first providing the service which is now used by numbers of business, up to the present. And in early 2010, the company launched the new online shop system which allows users to personalize and create in their own styles and is now popular amoung new sellers. Not only we has been developing the systems for internal use, but we also do it for other customers. When our works became well-known, more customers started to contact us " PorarDesign" is another team handling a lot of tasks and their customers, whose works need to be unique, delicate and creative, decide to contact the team always. Oh, and PorarDesign team is a team that created the FishUp! a popular game on Facebook as well. Our online marketing service of"RankGo"is done by our another department which had been formed in order to support customer’s need. They always seek for success in online business and want their websites to be famous, spending reasonable budget and directing to he right target. RankGo team is the one who specializes, as you can previously see from our works. Recently, eBooks.in.th is an online book store in gadgets. It will collect all electronic books in Thailand through our system on the website, www.ebooks.in.th, where writers and publishers are able to upload or send their ebooks files to directly and independently. After installed in gadgets such as iPad, iPhone, iPod, Android devices or eReader, you can download and read ebooks immediately from wherever you are in the world.